year 2016-17 was presented to the aviation minister Suresh Prabhu by Pawan Hans chairman B P Sharma on last week. “Pawan Hans has also outlined its business road map-2025 for its overall business expansion in Operational Services (Helicopters, Seaplanes and Small Fixed Wing Aircrafts), Training & Skill Development, Business Development & Projects (MRO, Heliports/Helipads) and Consultancy Services & Foreign Projects and RCS-UDAN-II and also to be 100 helicopters company by 2025,” a Pawan Hans statement said. “Under RCS-UDAN-II scheme of GoI, PHL won 11 Helicopter routes to connect various small towns in Uttrakhand, Himachal, Manipur and Assam. PHL has also launched its regular helicopter services for Daman –Diu-Daman sectors in association with Daman & Diu Administration on 24th Feb 2018. The new website has been designed to provide the ultimate user-friendly experience with improved navigation and functionality throughout for customers delight. E-Portal for online charter and e-ticket booking also a part of this website for passenger under ease of booking tickets cashlessly to promote digital India initiative of the government,” it added. "Pawan Hans achieved yet another record by registering a remarkable Profit After Tax (PAT) of Rs. 242.78 crores during 2016-17 and paid dividend of Rs.36.99 crores to GOI and ONGC for the financial year 2016-17 on 23rd March, 2018 at Ministry of Civil Aviation, Rajiv Gandhi Bhawan, New Delhi. The cheque of Rs.18.86 crore for the financial year 2016-17 was presented to the Minister of Civil Aviation Suresh Prabhu by Dr.B.P Sharma, CMD,Pawan Hans in the presence of Minister of State for Civil Aviation Jayant Sinha, Secretary,Civil Aviation, R.N. Choubey and other senior officials of Ministry and Pawan Hans. The new website has been designed to provide the ultimate user-friendly experience with improved navigation and functionality throughout for customers delight. E-Portal for online charter and e-ticket booking also a part of this website for passenger under ease of booking tickets cashlessly to promote digital India initiative of GoI. The flagship helicopter service provider of the Government of India, Pawan Hans has now evolved into south Asia’s largest helicopter company that maintains and operates a fleet of more than 50 helicopters. It provides a variety of services, making it the most trusted brand in the area of helicopter services. 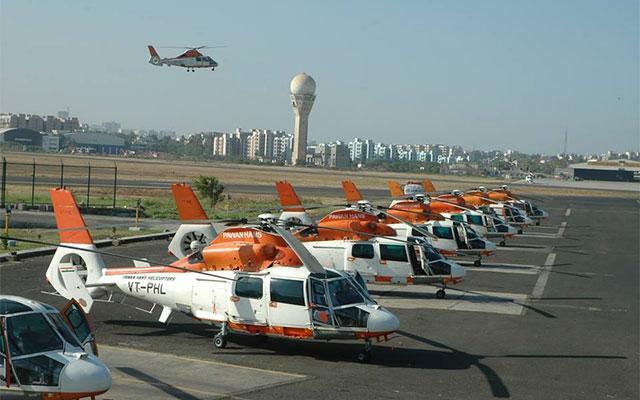 Off shore operations, connecting inaccessible areas, charter services, search and rescue work, VIP transportation, corporate and special charters, hotline washing of insulators and Heli-pilgrims are some of the major services of Pawan Hans. Further to strengthen its core business, Pawan Hans is diversifying into the fields of seaplane, small fixed wing aircraft, training & skill development, safety audit & consultancy, foreign projects and creation of infrastructure such as heliports and helipads as well.